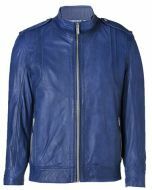 Very unique and dynamite Blue & Black Leather Jacket. Featuring front Zip closure, chest pockets in vertical shape, zipper sleeves and ban collar with tab closure. Lovely combination of Blue and Black Color. These features make this jacket very comfortable and easy to wear. 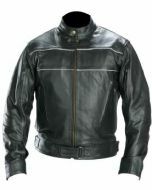 It is one the most time selling item at Leather Jackets For Men’s Store.